The global cranial implants market was valued at US$ 792.2 Mn in 2017. 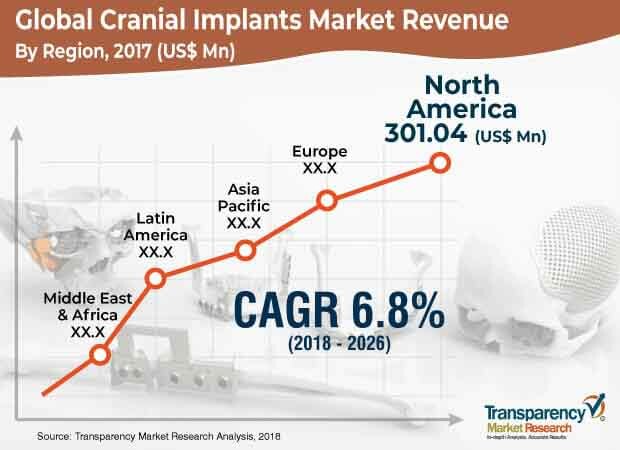 It is projected to expand at a compound annual growth rate (CAGR) of 6.8% from 2018 to 2026, according to a new report published by Transparency Market Research (TMR) titled ‘Cranial Implants Market Global Industry Analysis, Size, Share, Growth, Trends, and Forecast, 2018–2026.’ The report suggests that an increase in the geriatric population and rise in number of brain cancer and trauma cases are expected to propel the cranial implants market in the near future (2018 to 2026). North America is expected to dominate the global market, owing to an increase in the geriatric population, rise in the patient population, and rise in technological advances. The market in Asia Pacific is expected to expand at a CAGR of 7.6% during the forecast period, due to an increase in the geriatric population, rise in awareness, and increase in patient population in the region. Moreover, research and development activities and initiatives by governments in the health care sector are anticipated to further boost the market in Asia Pacific. The global cranial implants market is expected to be driven by value-added features offered by various cranial implants in order to provide effective and efficient implantation and restoration. Cranial implants are designed to ensure increased success rates of treatments and fewer complications. Cranial implants are used to repair cranial defects occurring due to injury, infection, hemorrhagic diseases, and tumor invasion. Cranial implantation takes place through cranioplasty, which is a surgical intervention or procedure. A cranial bone defect can occur after injury, infection, and tumor invasion or when an autogenous bone is unsuited for replacement after a decompressive craniectomy due to brain infarction or hemorrhage. Earlier, different types of materials were used for cranioplasty. With technological advancements, new materials and technological interventions are available, providing specificity for the patient population according to the treatment and surgeon. Due to advancements in technology, cranial implants can be designed according to skull defects and locations with further specifications included, thereby making treatments more effective and convenient for neurosurgeons. These attributes help medical professionals successfully provide treatments to patients with increased success rates and comparatively less time requirements for the treatment process. Key players operating the global cranial implants market are developing patient-specific and technological advanced products with value-added features. Market players are attaining government approvals and launching new and advanced products. The products offer efficacy, swiftness, and fewer complications. Key players are also actively participating in acquisitions and mergers, thereby enhancing their product line. Companies are also strengthening their research and developmental capabilities and are emphasizing on technological advancements, thereby offering value-added features in cranial implants. Cranial defects have traditionally been repaired with metal plates or bone cement and were sometimes enforced with stainless steel grids. The demerit of the conventional method is that a perfect fit and curvature can be difficult to attain in large reconstructions, specifically when the defect involves the craniofacial junction . Customized cranial implants provides ease of implantation process, better functionality, reduced risk of complications and infections, and significantly reducing operator time, These implants are also available in different composite materials and can be generated through technologically advanced methods such as computer aided design and 3-D printing. These customized cranial implants reconstruct the cranium perfectly by fitting exactly in the defect and provide a perfect reconstruction. Oxford Performance Materials (OPM) is a recognized leader in 3-D printing and high-performance additive manufacturing (HPAM). In February 2013, it received first the FDA clearance for its OsteoFab Patient-Specific Cranial Device, followed by its OsteoFab Patient-Specific Facial Device in July 2014. Based on product, the global cranial implants market has been segmented into polymer, ceramic, and metal. The metal and polymer segments are likely to lead the market during the forecast period. The most common material still in use is grade 5 surgical titanium (i.e., Ti-6Al-4V or Ti-6-4), which is part of the metal segment. The material is corrosion-resistant. In the polymer segment, polymethyl methacrylate (PMMA) is perhaps the most frequently used cranial bone graft substitute. PMMA offers the merits of a protective, defect-filling replacement that lacks post-operative inflammation. Several other polymers have been investigated for large format cranial implants: PEEK (poly-ether-ether ketone), Polypropylene Polyester Knitwear, and PEKK (Poly-ether-ketone ketone). Polymer segment materials have been used for the prefabrication of cranial implants and are more similar in their material properties to the surrounding bone, especially in regard to elastic modulus. They are, therefore, considered osteoconductive. Ceramic is malleable and extremely brittle and is used to fill minor gaps in the skull and not major defects. Moreover, ceramic implants are more expensive than PMMA- or Ti-implants prepared in the same manner. Therefore, metal and polymer are dominant segments of the global market. In terms of end-user, the hospitals segment held a leading share of the global cranial implants market in 2017. It is anticipated to gain market share by the end of 2026. The segment is expected to expand at a CAGR of 6.9% during the forecast period. Increase in the number of road accidents, trauma cases, injuries, and brain tumors and increase in the establishment of neurosurgery departments are boosting the hospitals segment of the global cranial implants market. Furthermore, a rise in the number of hospitals, increase in neurosurgery volume, and rise in the number of medical professionals and related care have contributed to the prominent share of the segment in the global market. North America held a key share of the global cranial implants market. The market in the region is likely to expand rapidly in the near future. Availability of technologically advanced cranial implants, increase in awareness among the population, rapid rise in the geriatric population, extensive research and development to provide more efficient and advanced products, increase in number of players, rise in number of medical professionals, and increase in the adoption of advance products by the patient population are the key factors propelling the cranial implants market in North America. The market in Asia Pacific is expected to expand at a rapid pace during the forecast period. Rise in population, increase in research and development, extensive government initiatives in the health care sector, increase in the number of people suffering from cranial abnormalities, and rise in investments by global key players in Asia pacific are major factors driving the cranial implants market in Asia Pacific. The report also provides profiles of leading players operating in the global cranial implants market. Zimmer Biomet, Stryker, Kelyniam Global Inc, Medartis, B. Braun Melsungen AG, DePuy Synthes, KLS Martin Group, Xilloc Medical B.V., Ortho Baltic, Medtronic are leading players operating in the global cranial implants market. These players accounted for a significant share of the market. These companies are focused on strengthening their geographic presence through strategic acquisitions and collaborations with other key players operating in the cranial implants market players in their respective domains and geography. Strong progressive research and development activities and efficient and technologically advanced products are major factors boosting the share of key players in the global cranial implants market.